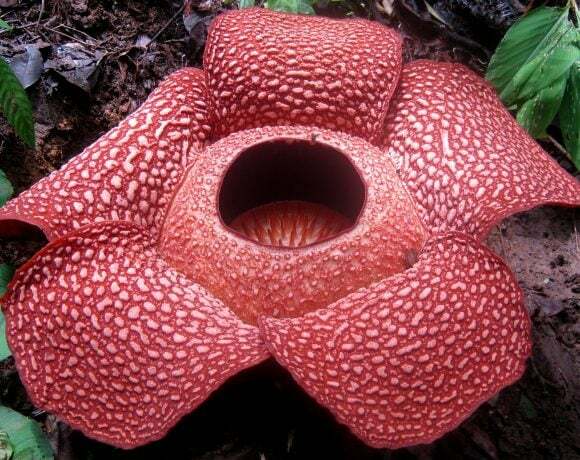 If you ever wonder what is the largest flower in the earth, we can give you the answer. 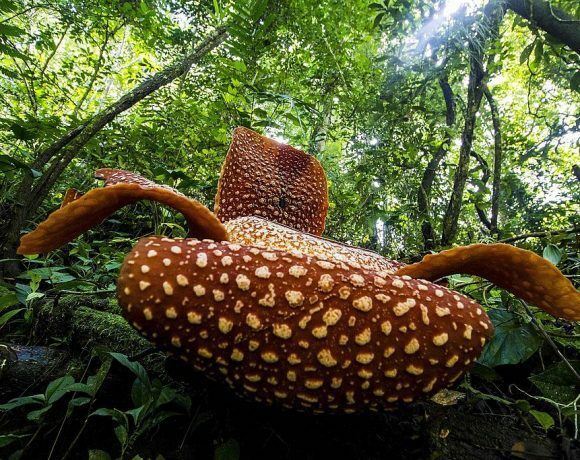 It is Rafflesia arnoldii, or as known as Padma Raksasa in Indonesian. Rafflesia arnoldii is noted for producing largest individual flower among other big flowers like titan arum and tailpot palm. It is one of three national flowers in Indonesia along with white jasmin and moon orchid. This flower is native to Sumatran rainforests and some may possibly be found in Borneo too. The big red flower is rare to be found and nationally recognized as rare flower in Presidential decree. Unlike other kinds of plants, this kind of flower doesn’t have any leaf. Thus, it also doesn’t have any chlorophyll to do the photosynthesis. 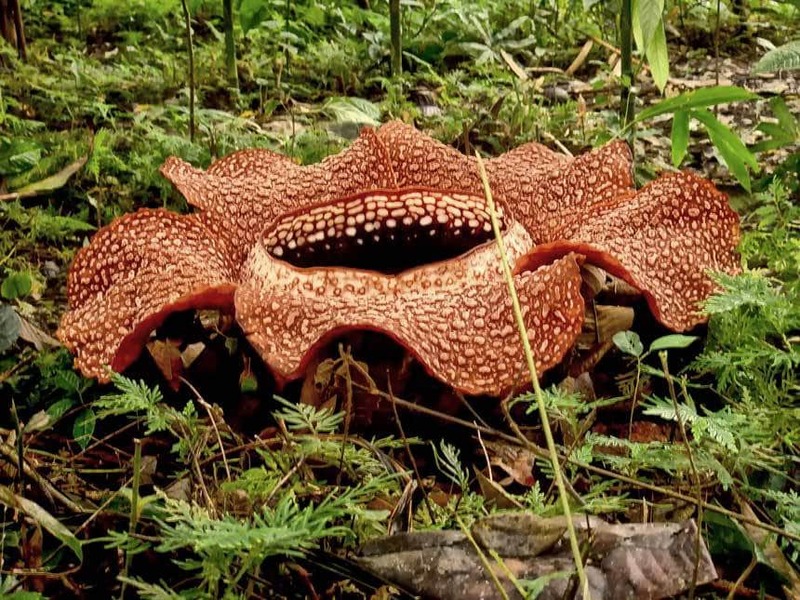 Indeed, although developing the largest flower on earth this plant is considered as parasitic flower. Although it must have existed for a very long time, this flower was first discovered in 1818. A British botanist Joseph Arnold and statesman Sir Thomas Stamford Bingley Raffles collected a specimen of flower found by a servant in Sumatra at that time. However, three months after the discovery Arnold passed away due to a fever, leaving the specimen unnamed. Arnold also left an unfinished drawing of the specimen which then continued by Lady Raffles, who was also present at the collection moment. The picture of the flower then sent to Joseph Banks along with preserved material example. Brown then passed the materials to Robert brown of British Museum and Kew’s resident botanical artist Franz Bauer to know what kind of plant it is. William Jack, the successor of Arnold in Sumatra found out that specimen was kind of similar to a previously found flower in Java by French botanist Louis Auguste Deschamps in 1818. But although having the rights to publish a name, Jack chose to wait for British Museum to produce a better paper. However, Jack did not mention any name for the newly discovered genus. 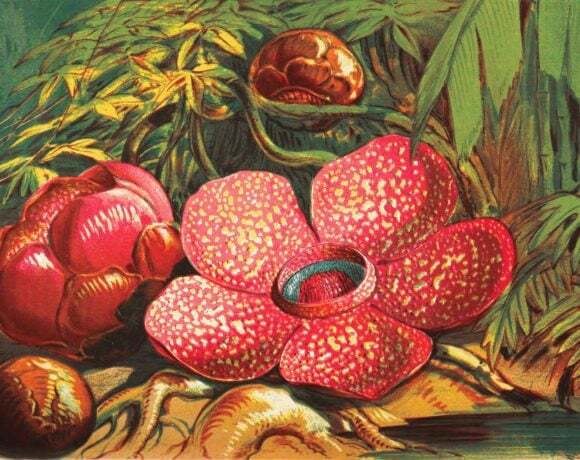 Afterall, Robert Brown proposed a name of Rafflesia Arnoldii to commemorate both Raffles and Arnold. The name was first described in the year of 1821 and since then this is the official name of the flower. Being known as the largest individual flower on earth, the plant can reach up to 105 centimeters in diameter. 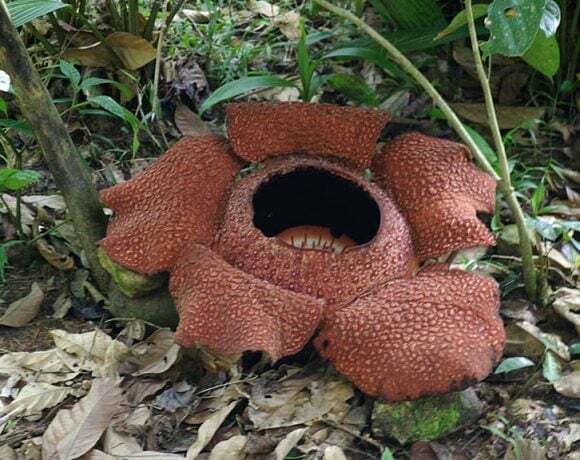 Not only large, this one is also a heavy flower, weighing up to 11 kilograms like the one measured in Palupah Nature Reserve near Bukittinggi, Sumatra. It is also known for the stinky smell it produces when blooming. The smell usually attracts insects and bugs to come to it like flies to pollinate the plant and help for the reproduction. Thus, we know that this plant is categorized to male and female plants. Because of its repulsive odor, the plant is also known as ‘corpse flower’, but not to be confused with titan arum which is granted the same calling. Most people detect the bloom of this flower by its smell that can be traced from distance. What’s unique from this plant is that the flower is the only observable part of the plant. It lacks of any observable parts of plants like leaves, stems, or roots. So, despite of having the largest flower on earth, the flower itself is the only part of the plant. Thus, like mentioned above, this plant cannot make its own food, so it needs another source of nutrition. That’s why, Rafflesia arnoldii is a kind of parasite that grows on other plants and drains nutrition and water from the host. We know already that this flower is the largest among of all flowers on earth, but in addition to the flower, this plant also produces the biggest flower buds. The flower emerges from huge maroon or reddish cabbage-like buds about 30 centimeters wide. The bud is actually the longest stage of the entire plant’s life. The Rafflesia spends about nine months as a bud, and as a bud it does not spread the stinky smell. But when the flower blooms, the noticeable stinky smell spreads. People also recognize the smell as the sign of Rafflesia blooming somewhere, and without it maybe this flower is impossible to locate. Not only because this flower grows in dense Sumatran rainforest, but also because it only blooms for several days before withering and die. The bud itself is pretty hard to locate considering the location of where it grows and the spreading of the seeds. Maybe this is a kind of defense mechanism to protect the rare flower from outside threats like humans. Hard to find and endemic, this flower is nationally enlisted as a rare flower. However, international conservationists like IUCN haven’t enlisted this flower as threatened or endangered flora. So, is this flower really a rare one? 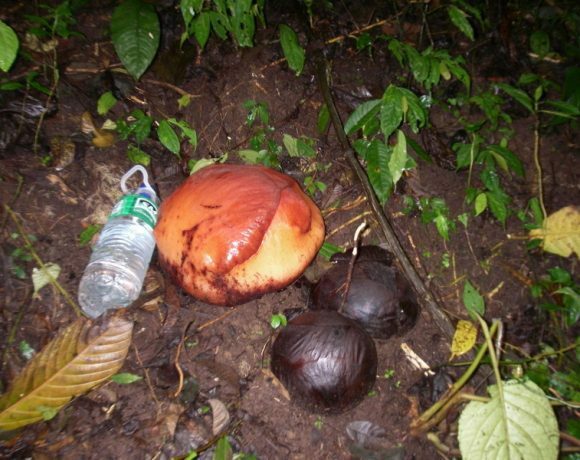 To understand about the rarity of Rafflesia arnoldii, we have to learn about how this flower is reproducing. Rafflesia blooms when it is ready to reproduce, and as mentioned above it reproduces by pollination. The pollination is a little bit tricky since it relies on the chance of insects that are attracted to its smell visit both the male and female flowers. Not only that, the order must be right, visiting the male first to gather the pollen and then visit the female one to put it down. After the pollination succeeded, a kind of fruit will be produced. This fruit is usually consumed by treeshrews, which then spread the seeds it contains. Because of the complex and tricky reproduction that highly depends on chances, that’s why the population of this flower is not that many. Not only that, outside threats like deforestation and other environmentally harmful human activities also threaten the endemic giant flower. Because it is endemic, so once the forests disappear this plant will follow. Many conservationists that realize the threats on this flower have tried to stimulate the recovery of the population, but any efforts done always met dead end. So, looking on those facts, don’t you think that this flower should be categorized as an endangered species?